Small and convenient, portable space heaters are a great choice for heating just one or two rooms, without turning up the heat in your whole house. Don’t be fooled by the marketing tactics of some of the expensive, “energy-efficient” space heaters on the market. All 1,500 watt heaters use nearly the same amount of energy to produce the same amount of heat. For less than $50 you should be able to find a heater with an adjustable thermostat and automatic shut-off in the event the heater is tipped over or overheats. Space heaters work best in enclosed areas. If you are heating one room, keep the door closed to keep the heat in. Make sure your heater is clean and its vents are unobstructed so it can run efficiently and safely. Keep it at least three feet from walls, furniture, or other combustible material. Use a space heater with a thermostat built in, and set it only as high as you need to keep comfortable. Always supervise children and pets around space heaters. Plug space heaters directly into outlets; do not use them with extension cords, and never use them around water. 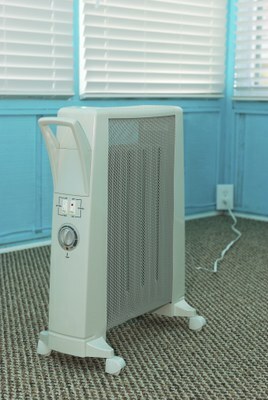 Only use space heaters that are UL-approved and shut down automatically if they are accidentally tipped over. Convection Space Heaters warm air in a room by blowing or pulling the air over a heated ceramic plate or metal coil element. Some convection heaters have fans, which heat a room quickly but are noisier. Oil-filled radiators are very quiet and provide consistent temperatures. Radiant Space Heaters heat objects and people directly in front of the heater. They are a good choice if you want instant heat or if you’re staying in one spot. Many radiant heaters glow when they’re on and may be too bright for nighttime use in a bedroom.